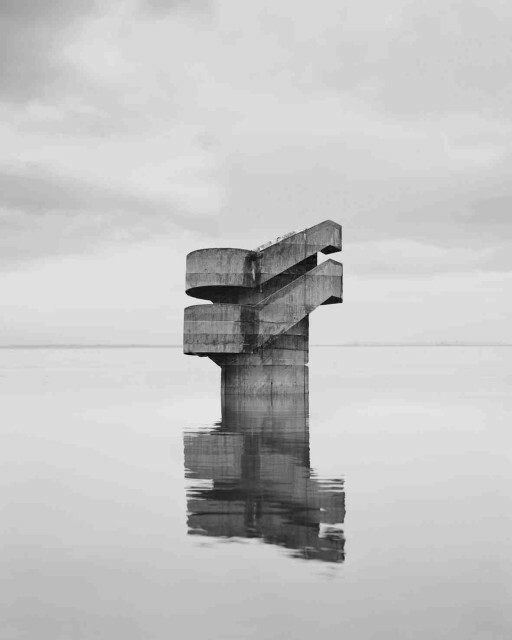 Noémie Goudal likes magic. She likes the mystical and the seemingly unexplainable. She also likes artifice. The two often go hand in hand and her photographic practice is laced with a desire to reach into the image and touch the realism that isn't there. Her first solo exhibition in a public gallery, sublimely titled 'The Geometrical Determination of the Sunrise', is an exploration into the future using a medium focussed on the past. The title refers to the history of architecture and more specifically the Archaic and Classical period's philosophy of constructing buildings with a combination of mathematics and astronomy. Goudal's black and white large-scale photographic series, 'Observatoires' (2013-14), directly reference the work of the Becher's famous typologies of post-industrial architecture. She uses flatter tones to accentuate the form of the astronomical observatories built by Maharajah Jai Singh II. These structures, facing up towards the heavens in domes and pyramids, were used to read the movement of sun, moon and stars, playing into the mystical elements of time that so fascinate Goudal. Approaching the image the realisation dawns that they are not buildings at all, but cut-outs, stage sets, artificial backdrops. Goudal has printed onto large bits of paper and transported to the shooting location, where she then photographs them in the eerie surroundings of what may or may not be a deserted beach or an Amazonian rainforest. The fine creases in the paper create a rift between the solid Brutalist architecture and the fleeting fragility of the photographic space. Alongside these is a new work, 'Study on Perspective I' (2014), which further deconstructs the photographic image as reality. The image of the interior of Ruhr University Bochum, the first university founded in post-war Germany, is sliced into four layers creating an illusory third dimension. This accompaniment to the 'Observatoires' lacks their mystery with the eerie locations stripped away. There is more enigmatic work around the corner: the sound of a hypnotic, pulsing drone emanates from the adjacent room. In it, a portrait format projection reaches up to the ceiling of the tall gallery space, men are metronomically diving into a body of water. 'Divers' (2014) was commissioned alongside 'Tanker' (2014) by the New Art Gallery Walsall for the exhibition. They are the most important works in this show, adding humans into the otherworldly, sci-fi scene. 'Tanker' has the same rhythmic quality as 'Divers' only this time it has workers of the world's largest oil tanker descending and ascending the stairs from the depths. This enables the viewer to gain a perspective of how they fit into her constructions, they are not artificial, but then neither are the two-dimensional backdrops in the Observatoires or the sliced layers in 'Study on Perspective I'. The constructed reality of the stars, the moon and the sun are all created out of human perception and our desire to understand the world. Sometimes it's the trick that comes first and we have to understand that before we can understand what's behind it. Goudal likes magic, but she also knows it is only as real as we are.